Going beyond the view of conflict through a security framework associated with belligerency and violence, Lebanon Support upholds that conflict is of a socio-political nature. It thus sheds light on dynamics underlying a broad spectrum of violent and non violent contentions including social movements, passing by conflicts opposing minorities (ethnic, religious or sexual among others) as well as local, national or regional actors’ policies. Read more and check the interactive conflict map here. The last third of 2016 – the months of September-December – has seen the least number of incidents since the beginning of the year at only 1,366 conflicts mapped, though the number of villages, categories of conflict incidents, and actors mapped throughout the year have stayed relatively consistent. However, it is important to note here that Lebanon Support’s mapped conflicts for the months of January-April 2016 only surpassed this number by 41 incidents, while the second third of the year, or the months of May-August 2016, stands out as an outlier with 1,832 conflict incidents mapped. Taking a closer look at the data, it is interesting to note that South Lebanon was the governorate with the greatest number of incidents in the last third of the year, with 284 conflict incidents mapped in the region. Of these incidents, 87 incidents are Individual Acts of Violence and 134 incidents are Israeli Border Conflicts, heavily categorised as airspace and sea-border violations, although also including incidents of bombardment and land violations. North Lebanon and Bekaa closely followed the South governorate, with 272 (147 Individual Acts of Violence) and 267 (110 Individual Acts of Violence) incidents respectively. Most importantly, Beirut governorate had the least amount of incidents recorded with only 177 incident (96 Individual Act of Violence) mapped from September to December. This is the first time in 2016 where incidents mapped in Beirut have fallen underneath 200 in a four months period and is partially due the fact that Individual Acts of Violence Conflicts, such as individuals’ arrests, are not being as thoroughly reported by Internal Security Forces and other law enforcement groups within Lebanon. Even so, arrest/detention was the most mapped category in the last third of 2016 with 435 incidents. This is followed by, in decreasing order: airspace violation (247 incidents), collective action (149 incidents, refer to the ‘focus’ visual below), raid (79 incidents),and brawl/dispute (77 incidents). These top five mapped categories were the same in May-August 2016, with only collective action and raid switching slots. 72% of all mapped incidents in the studied period fell under these categories (see our categories and classifications on our conflicts map). The most mapped actors are the Israeli Military, Internal Security Forces, Lebanese Armed Forces, Lebanese Civilians, and Palestinian civilians, the latter having emerged as one of the most mapped actors. This can be attributed to 70 incidents occurring in the Ain el-Helwe refugee camp. Of these incidents, 11 were collective actions, where Palestinians within the camp were protesting growing violence within their community, as well as socio-economic grievances such as water cuts (for more on collective actions, refer to the ‘Focus’ visual below). Individual acts of violence and Border conflicts on the Israeli border have consistently been the most mapped classification of incidents since the beginning of the year. This is consistent with conflict trends recorded over the year 2015, which saw Airspace violations mostly by Israeli Military, arrests/detentions, shootings, and raids – all three of which can be classified as individual acts of violence – as part of the most mapped conflict categories. On the one hand, this corroborate Israeli border conflicts as the ongoing invisible conflict; and on the other, it highlights the response of state actors towards individual acts of violence and crime in general. It is noteworthy to point out that the most mapped secondary category over September-December 2016 was illicit trade/trafficking, which can also explain the high frequency of individual acts of violence, as well as the spike in Power and Governance December 30th, on which the ISF arrested multiple individuals at the Rayak checkpoint for possessing quantities of cocaine. Though incidents of Conflicts of Social Discrimination in the primary classification, as seen above, only total for 14 incidents in the months of September-December, conflicts of social discrimination rise to a total of 56 incidents (including 25 raids) when taking into consideration both the primary and the secondary classification. These 56 conflict incidents highlight unjust treatment of individuals or groups, related to a lack of protection and rights, inefficiency of the justice system and persisting social and economic vulnerabilities. This social discrimination is based on race, age, gender, sexuality, or other characteristics of one’s identity. As such, this classification includes restrictions on residents (inc. curfews), usually affiliated with curfews on Syrian refugees, collective actions, and gender based violence (GBV). Most notably, 13 of the 23 incidents mapped as gender based violence (inc. domestic violence, prostitution, etc.) in 2016 occurred in the last third of the year which may be attributed to the fact that there has been more focus and media revolving around women’s rights and gender issues in the last few months, especially taking into consideration the 16 days of activism against gender based violence and the repeal of Article 522 of the Lebanese Penal Code, which allows rapists to get away with their crime if they marry their victims. See our last Gender Bulletin for more on this. While Policy Conflicts were prominent in the 1st third of the year, this last third witnesses a significant and consistent surge of these incidents, especially in the month of October which has seen a number of collective actions all over the country relevant to public transportation, with public drivers organising strikes, but also to demonstrations in support of political figures, most notably after the election of Michel Aoun as president and the nomination of Saad Hariri as prime minister, with their supporters rallying in celebration on the 31st of October for the former and the 3rd of the November for the latter. More on these collective actions can be seen in the following visual. As the above visual shows, there were 149 collective actions that took place in the months of September-December 2016, very close to the 146 collective actions mapped in the same months in the year 2015. This last third of the year 2016 does show a 50% increase of social mobilisations, compared to the previous period of May-August 2016, when only 107 collective actions were mapped. Overall, the 149 collective actions are overwhelmingly linked to policy conflicts, as the causes for which people mobilised attest. The greatest amount of collective actions were relevant to public transportation with taxi and bus drivers organising demonstrations since September against the privatisation of mandatory vehicle inspection centres and a fee hike of over 50%. The centres were initially founded by the government, but recently, the centres have turned to outsourcing management to private firms. As such, public drivers, many a part of the Public Driver’s Union or the Union and Leagues of Land Transport, have organised sit ins, protests and strikes held across the country, at times also blocking roads and entrances to centres. These demonstrators demand the government take back the management of all their facilities. As mentioned previously, Palestinian civilians/refugees were involved in many collective actions, 11 of which took place in Ain el-Helwe and are linked to the deterioration of the security situation in the camp and quality of services provided by UNRWA, which suspended its work December 31st in the camp indefinitely due to ongoing gun violence and volatility within Ain el-Helwe between rival factions. It is important to note here that while the building of a security wall surrounding the camp was covered heavily by media and human rights groups throughout November, only one protest occurred against the building of the wall, which was then halted by late November. In the Beddawi camp, 5 protest took place with Palestinian refugees and Palestinian refugees from Syria mobilising for more aid and better provision of services by UNRWA. Such mobilisations balance a widespread preconceived idea of all refugees being passive and rather highlights demands for increased agency among the refugee populations, especially Palestinian refugees. Mobilisations relevant to the waste management crisis and other demands from government, relevant to better public services, public spaces, and women’s rights, are still ongoing, with a surge in protests specifically linked to detainees and prisoners, for example the case of the mother detained in custody dispute which received high media coverage or mobilisations of families of detainees, which underscores how the legislative system is being challenged. Access to Healthcare for Syrian Refugees. The Impact of Fragmented Service Provision on Syrians’ Daily Lives. This report aims to explore the fragmented organisation of healthcare services in Lebanon, for Syrian refugees. Although it is not an assessment of the Lebanese healthcare system, this report does nevertheless reflect on the challenges and underlying dynamics of the current Lebanese system, which are reproduced in the healthcare provision for Syrian refugees. In this sense, the report highlights the privatised, rather ad hoc, and irregular provision of healthcare in Lebanon, notably for Syrian refugees, which tends to take on a more curative rather than preventive approach, resulting in significant costs on the patients. Consequently, a great number of vulnerable Lebanese and non-Lebanese residing in Lebanon, notably Syrian refugees, are unable to access health services. It is the third of a series of reports published in 2016, the 1st of which being "Formal Informality, Brokering Mechanisms, and Illegality. The Impact of the Lebanese State’s Policies on Syrian Refugees’ Daily Lives." and the 2nd "Syrian Refugees' Livelihoods. The Impact of Progressively Constrained Legislations and Increased Informality on Syrians’ Daily Lives." Click here to read more and access the pdfs of both the English and Arabic versions of the report on health. Click here to read more and access the pdfs of both the English and Arabic versions. Click here to read more and access the pdf. 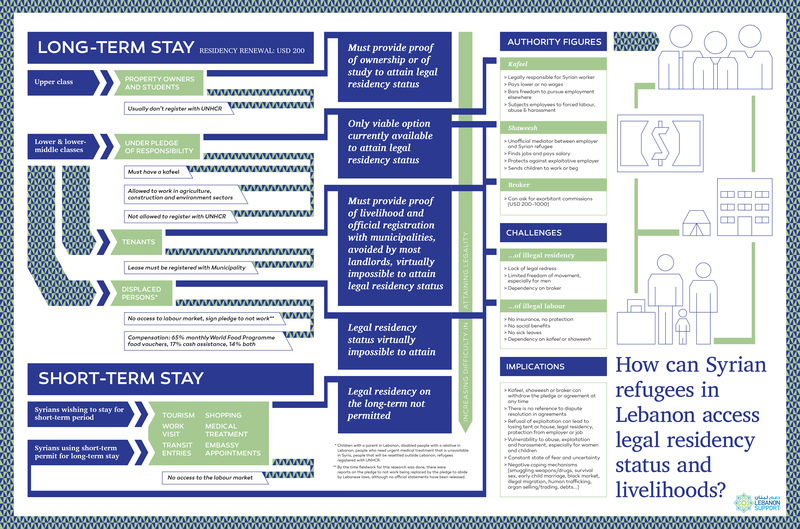 This visual summarises findings from research by Lebanon Support looking into the impact of the Lebanese government's policies on Syrian refugees' daily lives, and highlights the options available to Syrian refugees to access legal residency status and the labour market, as well as the authority figures they have to deal with, and the challenges and implications of these circumstances. Click here to read more and access the high resolution visual. وتتضمّن هذه النشرة موادا بصرية تُركِّز على اتجاهات النزاعات الممسوحة خلال ثاني أربع أشهر من السنة. كما أنها تسلط الضوء على مروحة منتقاة من أحدث المطبوعات والمنشورات على صفحة مشروع تحليل النزاعات، بما في ذلك الأوراق، والمقالات، والتقارير، والمواد البصرية، والمحتوى التفاعلي. شهد الثلث الأخير من العام 2016 ـ الأشهر من أيلول/سبتمبر إلى كانون الأول/ديسمبر ـ العدد الأقل من الحوادث منذ بداية العام واقتصر على 1366 نزاعاً ممسوحاً، على الرغم من أنّ فئات النزاعات الممسوحة خلال العام والأطراف الفاعلة والقرى التي وقعت فيها ظلّت ثابتةً نسبياً. وعلى الرغم من ذلك، فمن الأهمية بمكانٍ الإشارة هنا إلى أنّ النزاعات التي عمل مركز دعم لبنان على مسحها بالنسبة إلى الأشهر من كانون الثاني/يناير إلى نيسان/أبريل 2016 تخطّت هذا العدد بـ41 حادثاً فقط، في حين يبرز الثلث الثاني من العام، أو الأشهر من أيار/مايو إلى آب/أغسطس 2016، بوصفه ناشزاً بـ1832 حادث نزاعٍ ممسوح. وبإلقاء نظرةٍ متفحصةٍ على البيانات، من المثير للاهتمام ملاحظة أنّ لبنان الجنوبي كان المحافظة التي سجّلت العدد الأكبر من الحوادث في الثلث الأخير من العام بـ284 حادث نزاعٍ ممسوح في المنطقة. من بين هذه الحوادث، هنالك 87 حادثاً من أعمال العنف الفردية و134 حادثاً من النزاعات الحدودية مع إسرائيل، صُنّفت بصرامةٍ في فئتي الانتهاكات الحدودية الجوية والبرية على الرغم من أنّها تتضمّن أيضاً حوادث قصفٍ مدفعي وانتهاكاتٍ برّية. تلت محافظتا لبنان الشمالي والبقاع محافظة لبنان الجنوبي، بـ272 حادثاً (منها 147 حادثاً من أعمال العنف الفردية) و267 حادثاً (منها 110 حوادث من أعمال العنف الفردية) على التتالي. والأكثر أهميةً أنّ محافظة بيروت سجّلت العدد الأقل من الحوادث المسجلة بـ177 حادثاً ممسوحاً فقط (منها 96 حادثاً من أعمال العنف الفردية) من شهر أيلول/سبتمبر إلى شهر كانون الأول/ديسمبر. إنّها المرة الأولى التي انخفضت فيها الحوادث الممسوحة في بيروت في العام 2016 إلى ما دون 200 حادثٍ في فترة أربعة أشهر، ويعود ذلك جزئياً إلى أنّ قوى الأمن الداخلي وغيرها من جهات إنفاذ القانون في لبنان لم تعد تنشر بالكامل نزاعات أعمال العنف الفردية، من قبيل توقيفات الأفراد. وعلى الرغم من ذلك، كانت فئة التوقيفات/الاحتجازات من أكثر الفئات الممسوحة في الثلث الأخير من العام 2016 بـ435 حادثاً. يلي ذلك، بترتيبٍ تنازلي، الانتهاكات الجوية (247 حادثاً)، التحركات الشعبية (149 حادثاً، الرجوع إلى ‘إضاءة’ المواد البصرية أدناه)، المداهمات (79 حادثاً)، المشاجرات/الخلافات (77 حادثاً). كانت هذه الفئات الخمس الأعلى الممسوحة هي نفسها في الأشهر من أيار/مايو إلى آب/أغسطس 2016، مع تبادلٍ بين عدد التحركات الشعبية والمداهمات فحسب. يندرج 72 بالمئة من كافة الحوادث الممسوحة في الفترة المدروسة ضمن هذه الفئات (انظر الفئات والتصنيفات الخاصة بنا في خريطة النزاعات خاصتنا). تجدر الإشارة إلى أنّ الأطراف الفاعلة الأكثر ظهوراً على خرائطنا هي الجيش الإسرائيلي وقوى الأمن الداخلي والجيش اللبناني والمدنيون اللبنانيون والمدنيون الفلسطينيون؛ وقد برز المدنيون الفلسطينيون بوصفهم أحد أكثر الأطراف الفاعلة ظهوراً. يمكن أن يعزى هذا الأمر إلى الحوادث السبعين في مخيم عين الحلوة للاجئين. ومن هذه الحوادث، كان هنالك أحد عشر حادث تحركٍ شعبي تظاهر فيها الفلسطينيون احتجاجاً على العنف المتنامي داخل مجتمعهم المحلي، وكذلك على مظالم اقتصادية اجتماعية من قبيل انقطاع المياه (للمزيد حول التحركات الشعبية، يرجى الرجوع إلى ‘إضاءة’ المواد البصرية أدناه). تأتي أعمال العنف الفردية والنزاعات الحدودية على الحدود الإسرائيلية في مقدّمة التصنيفات الممسوحة للحوادث منذ بداية العام. يتماشى هذا الأمر مع اتجاهات النزاعات المسجلة أثناء العام 2015 الذي شهد انتهاكاتٍ جويةً ارتكب الجيش الإسرائيلي معظمها، وحالات التوقيف/الاحتجاز وحالات إطلاق النار والمداهمات ـ يمكن تصنيف ثلاثتها بوصفها أعمال عنفٍ فردية ـ كجزءٍ من فئات النزاع الأكثر ظهوراً. ما يؤكد أنّ النزاعات الحدودية مع إسرائيل تقع في خانة النزاعات غير المرئية المتواصلة، هذا من جانبٍ، كما أنّه يسلط الضوء من جانبٍ آخر على ردّ الجهات الحكومية الفاعلة على أعمال العنف الفردية وعلى الجريمة بصورةٍ عامة. كذلك، تجدر الإشارة إلى أنّ الفئة الثانوية الأكثر ظهوراً في الأشهر من أيلول/سبتمبر إلى كانون الأول/ديسمبر 2016 هي فئة التجارة/الإتجار غير المشروعين، ما يمكن أن يوضّح أيضاً التواتر الكبير لأعمال العنف الفردية، وكذلك تصاعد النزاعات على السلطة والحكم في 30 كانون الأول/ديسمبر، حين قامت قوى الأمن الداخلي بتوقيف أشخاصٍ متعددين في حاجز تفتيش رياق لحيازتهم كمياتٍ من الكوكايين. وعلى الرغم من أنّ مجموع النزاعات المرتبطة بالتفرقة الاجتماعية في التصنيف الأوّلي للنزاع، كما شاهدنا آنفاً، لا يتجاوز 14 حادثاً في الشهر من أيلول/سبتمبر إلى كانون الأول/ديسمبر، فقد ارتفع المجموع إلى 56 حادثاً (من ضمنها 25 مداهمة) حين نأخذ بالحسبان التصنيفين الأولي والثانوي. تسلّط هذه الحوادث النزاعية الـ56 الضوء على المعاملة غير العادلة للأفراد أو المجموعات في ما يتعلّق بفقدان الحماية والحقوق، وعلى قصور النظام القضائي واستمرار أوجه الهشاشة الاجتماعية والاقتصادية. تقوم هذه التفرقة الاجتماعية على العرق أو العمر أو النوع الاجتماعي (الجندر) أو الجنسانية أو السمات الأخرى لهوية الشخص. وعلى هذا النحو، يتضمّن هذا التصنيف القيود المفروضة على السكان (حظر التجول المحدود) والمرتبطة عادة بفرض حظر التجول على اللاجئين السوريين والتحركات الشعبية والعنف القائم على النوع الاجتماعي. ومن الجدير بالذكر أنّ 13 حادثاً من أصل 23 حادثاً جرى مسحها بوصفها حوادث عنفٍ قائمة على النوع الاجتماعي (بما في ذلك العنف المنزلي المحدود والبغاء وما شابه) في العام 2016 حدثت في الثلث الأخير من السنة، وقد يُعزى ذلك إلى واقع وجود تركيزٍ أكثر في وسائل الإعلام على حقوق المرأة وقضايا النوع الاجتماعي في الشهور الأخيرة، لاسيما إذا أخذنا في الحسبان 16 يوماً من الفعالية لمناهضة العنف القائم على النوع الاجتماعي وإلغاء المادة 522 من قانون العقوبات اللبناني التي تسمح للمغتصبين بالإفلات من العقوبة إذا تزوجوا ضحاياهم. للمزيد حول هذا الأمر، انظر العدد الأخير من نشرة العدالة الجندرية خاصتنا. كانت النزاعات السياسية بارزةً في الثلث الأول من العام، في حين شهد الثلث الأخير منه زيادةً ثابتةً وذات دلالة لهذه الحوادث، لاسيما في شهر تشرين الأول/أكتوبر الذي شهد عدداً من التحركات الشعبية في أرجاء البلد تتصل بالنقل العام، مع تنظيم السائقين العموميين عدداً من الإضرابات، وتتصل كذلك بمظاهراتٍ لدعم شخصياتٍ سياسية، وبخاصةٍ بعد انتخاب ميشال عون رئيساً للبلد وتسمية سعد الحريري رئيساً لمجلس الوزراء، مع احتشاد مؤيديهما للاحتفال بالأوّل في 31 تشرين الأول/أكتوبر وبالثاني في الثالث من تشرين الثاني/نوفمبر. يمكن مشاهدة معظم هذه التحركات الشعبية في المادة البصرية التالية. كما تظهر المادة البصرية أعلاه، فإنّ عدد التحركات الشعبية في الأشهر من أيلول/سبتمبر إلى كانون الأول/ديسمبر 2016 بلغ 149 تحركاً، وهو قريبٌ جداً من عدد التحركات الشعبية الممسوحة البالغ 146 تحركاً في الأشهر نفسها من العام 2015. كما أنّ الثلث الأخير من العام 2016 يظهر ازدياد التحركات الاجتماعية بنسبة 50 بالمئة مقارنةً بالفترة السابقة، أي أشهر أيار/مايو ـ آب/أغسطس 2016، حين لم يتجاوز عدد التحركات الممسوحة 107. بصورةٍ عامة، ارتبطت التحركات الشعبية الـ149 بشكلٍ كبير بالنزاعات السياسية، مثلما تشهد على ذلك الأسباب التي حرّكت الناس. اتّصل الكمّ الأعظم من التحركات الشعبية بالنقل العام مع تنظيم سائقي الحافلات وسيارات الأجرة مظاهراتٍ منذ شهر أيلول/سبتمبر ضدّ خصخصة مراكز فحص المركبات الإلزامي وارتفاع الرسوم بأكثر من 50 بالمئة. أنشأت الحكومة المراكز بدايةً، لكنّها عهّدت إدارتها في الآونة الأخير لشركاتٍ خاصة. وعلى هذا النحو، نظّم السائقون العموميون، وكثيرٌ منهم جزءٌ من اتحاد السائقين العموميين واتحاد النقل البري، اعتصاماتٍ واحتجاجاتٍ وإضراباتٍ في أنحاء البلاد، وفي بعض الأحيان أغلقوا الطرقات والمداخل المؤدية إلى المراكز. يطالب هؤلاء المتظاهرون الحكومة باستعادة إدارة كافة مرافقها. وكما ذكرنا سابقاً، شارك المدنيون/اللاجئون الفلسطينيون في كثيرٍ من التحركات الشعبية، جرى 11 تحركاً منها في مخيم عين الحلوة وتعلّقت بتدهور الوضع الأمني في المخيم ونوعية الخدمات التي تقدّمها الأونروا التي علّقت بتاريخ 31 كانون الأول/ديسبمر أعمالها في المخيم إلى أجلٍ غير مسمّى بسبب العنف المسلح الدائر والتقلب بين الفصائل المتناحرة داخل المخيم. تجدر الإشارة هنا إلى أنّ وسائل الإعلام ومجموعات حقوق الإنسان غطّت بشكلٍ كبير بناء الجدار الأمني المحيط بالمخيم في شهر تشرين الثاني/نوفمبر، في حين لم يحدث إلا احتجاجٌ واحدٌ على بناء الجدار الذي توقف بحلول نهاية تشرين الثاني/نوفمبر. وفي مخيم البداوي، قامت خمسة احتجاجاتٍ للاجئين الفلسطينيين واللاجئين الفلسطينيين من سوريا الذين احتشدوا لمطالبة الأونروا بتقديم مزيدٍ من المساعدة وخدماتٍ أفضل. توازن مثل هذه التحركات الفكرة المسبقة الواسعة الانتشار عن سلبية جميع اللاجئين، وتسلّط الضوء إلى حدٍّ ما على مطالب بزيادة التفويض بين السكان اللاجئين، لاسيما اللاجئين الفلسطينيين. أمّا التحركات المتعلقة بأزمة إدارة النفايات ومطالب أخرى من الحكومة تتعلق بخدماتٍ عامةٍ أفضل وفضاءاتٍ عامة وحقوق المرأة، فلا تزال جاريةً، مع تصاعد الاحتجاجات، وبخاصةٍ تلك المتعلقة بالسجناء والمعتقلين، على سبيل المثال حالة الأم المحتجزة قيد التوقيف على الرغم من حصولها على تغطية كبيرة من وسائل الإعلام وتحركات أهالي المعتقلين، ما يؤكد الكيفية التي يتمّ بها تحدي النظام التشريعي. حصول اللاجئين السوريين على الرعاية الصحية. تأثير السياسات المقيدة تدريجياً والإجراءات غير النظامية على حياة السوريين اليومية. يهدف هذا التقرير إلى استجلاء التنظيم المجزأ لخدمات الرعاية الصحية في لبنان، مع تركيزٍ خاصٍ على حصول اللاجئين السوريين على الرعاية الصحية. وعلى الرغم من أنّ هذا التقرير ليس تقييماً لنظام الرعاية الصحية في لبنان، إلا أنّه يمعن النظر مع ذلك في إعادة إنتاج التحديات والديناميّات الكامنة في النظام اللبناني القائم. وبهذا المعنى، يسلط هذا التقرير الضوء على خصخصة الرعاية الصحية في لبنان وعدم الانتظام في توفيرها والذي يميل إلى تبني مقاربةٍ علاجيةٍ أكثر مما هي وقائية، ما يفضي إلى تكاليف كبيرة يتكبدها المرضى. وبناءً على ذلك، فإنّ عدداً كبيراً من المستضعفين اللبنانيين وغير اللبنانيين المقيمين في لبنان، ولاسيما اللاجئين السوريين، غير قادرين على الوصول إلى الخدمات الصحية. وهو التقرير الثالث في سلسلة تقارير نُشرت في العام 2016، كان الأول بعنوان "الإجراءات المنظّمة غير النظامية وآليات السمسرة والأوضاع غير القانونية. تأثير سياسات الدولة اللبنانية في حياة اللاجئين السوريين اليومية"، والثاني بعنوان "سبل عيش اللاجئين السوريين. تأثير التشريعات المقيدة تدريجياً والإجراءات غير النظامية على حياة السوريين اليومية". اضغط هنا لقراءة المزيد والوصول إلى النسختين الإنكليزية والعربية من التقرير حول الصحة بصيغة pdf. "الصديق وقت الضيق". نحو تدخلاتٍ وسياساتٍ قائمةٍ على أساس الحقوق لصالح اللاجئين السوريين في لبنان. يُحلّل موجز السياسات هذا الآثار الاجتماعية ـ السياسية لهذه السياسة، ويقترح تدابير تشريعية وسياسية وعملية لتحسين وضع اللاجئين السوريين في لبنان. كما أنّه يهدف إلى تقديم معلومات لمعدّي السياسات التي تتعلق باللاجئين السوريين من منظورٍ قائمٍ على أساس حقوق الإنسان، في حين يناقش وسائط لتعزيز البرمجة على صعيد المجتمع المدني. اضغط هنا لقراءة المزيد والوصول إلى النسختين الإنكليزية والعربية بصيغة pdf. سياق النزاع في طرابلس: إهمالٌ حاد، وفقرٌ متزايد، وأزمة قيادة. يُقدّم هذا التقرير تحليلاً للديناميات السياسية والاجتماعية والاقتصادية الراهنة في طرابلس، لبنان. يبدأ التحليل بلمحةٍ موجزةٍ عن تاريخ طرابلس في القرن العشرين والجهود التي تبذلها الدولة لتأطير المشهد الاجتماعي والسياسي الراهن. يركّز التقرير بصورةٍ خاصةٍ على الكيفية التي ساهمت فيها سياسة الدولة تجاه المدينة، إلى جانب العلاقة التاريخية الخاصة لطرابلس بسوريا، في النزاع المسلح الدائر والركود الاقتصادي والفقر والانقسام السياسي في طرابلس. اضغط هنا لقراءة المزيد والوصول إلى نسخةٍ بصيغة pdf. تلخص هذه المادة البصرية نتائج بحثٍ أجراه مركز دعم لبنان لتفحّص تأثير سياسات الحكومة اللبنانية في حياة اللاجئين السوريين اليومية، وتسلّط الضوء على الخيارات المتاحة أمام اللاجئين السوريين للحصول على وضع الإقامة القانوني ودخولهم القانوني إلى سوق العمل، وكذلك شخصيات السلطة التي عليهم أن يتعاملوا معها، وتحديات هذه الظروف وعواقبها. اضغط هنا لقراءة المزيد والوصول إلى مادةٍ بصريةٍ عالية الدقة.